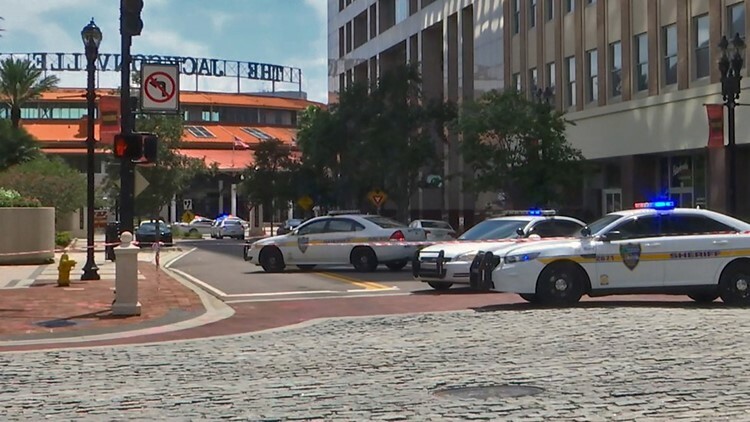 This handout image distributed courtesy of WJXT, a local Jacksonville television station, shows police cars blocking a street leading to the Jacksonville Landing area in downtown Jacksonville, Florida, August 26, 2018. Several people have been killed in a mass shooting at a video game tournament in the northern Florida city of Jacksonville, local police said Sunday, August 26, 2018, adding that one suspect was dead. 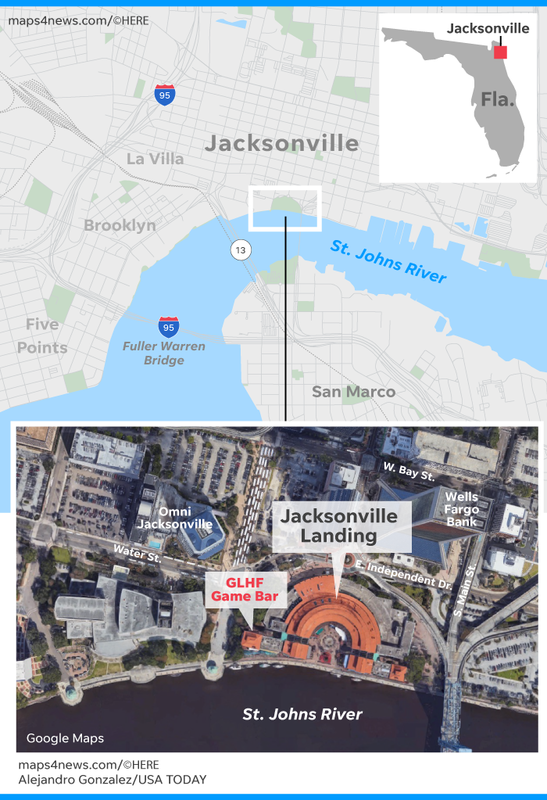 Multiple people were killed Sunday when a gunman opened fire during a Madden 19 video game tournament at a gaming bar along Jacksonville's riverwalk, authorities in the Florida city said. "Mass shooting at the Jacksonville Landing. Stay far away from the area. The area is not safe at this time. STAY AWAY," the Jacksonville Sheriff's Office said in a tweet. The sheriff's office said there were "multiple fatalities" and that many other victims were transported to hospitals. One suspect was dead at the scene, and it was unknown whether there was a second shooter, the sheriff's office said. A search was underway. Multiple media outlets, including WJXT-TV, said four people were dead and several more wounded. Authorities urged people hiding in the area call 911 so police can get them out. "We are finding many people hiding in locked areas at The Landing," the sheriff's office said. "We ask you to stay calm, stay where you are hiding. SWAT is doing a methodical search inside The Landing. We will get to you. Please don’t come running out." A live feed from the tournament was underway when the shooting took place, and the audio feed was interrupted by the sound of several gunshots. Gov. Rick Scott said he had promised Mayor Lenny Curry and other officials in Jacksonville any state support they might need. Jacksonville is about 300 miles north of Parkland, where a gunman killed 17 people in a rampage at Marjory Stoneman Douglas High School on Valentine's Day. Sen. Bill Nelson issued a statement after Sunday's shooting saying "Word of another tragic mass shooting in our state brings shock and outrage." Ryan Alemon said he was in the bar when at least one gunman opened fire. "Everyone was running, they were dropping because they were getting shot," Alemon told CNN. "I heard yelling, I heard 'Help me, I'm shot.'" Alemon said he hid in bathroom for about 10 minutes before fleeing the bar when he was certain the shooting was over. "I am still in shock," he said. Video game giant Electronic Arts issued a statement saying it was "aware of an incident at a sanctioned Madden Championship Series competition in Jacksonville. We are working with authorities to gather facts at this stage." Complexity Gaming, a professional gaming team that had a player participating in the event at the GLHF Game Bar, said on Twitter participant Grini Gjoka was grazed in the hand but was "away from the scene and safe." Gjoka tweeted that he was hit in the thumb when the tournament "got shot up." "Worst day of my life," Gjoka said. "I will never take anything for granted ever again. Life can be cut short in a second." The Jacksonville Landing is an entertainment complex along the St. Johns River. The area includes waterfront restaurants and an indoor shopping mall. The gaming bar bills itself online as "Jacksonville's home for gamers and nerds alike." The shooting took place less than two days after a gunfire at a high school football game a few miles away, which left one person dead and two wounded.